The Pet Shop Boys and Dusty Springfield. Morrissey and Sandie Shaw. The Bee Gees and Dionne Warwick. Jack White and Loretta Lynn. The KLF and Tammy Wynette. There’s a great tradition in pop music of collaboration between iconic female singers and contemporary singer/songwriter producers that brings their work and back stories to the attention of a new generation. Note that I don’t use the word ‘rescue’, although in the case of Dusty Springfield, the timely approach of the Pet Shop Boys with “What Have I Done to Deserve This?” led directly to a welcome late career revival. I hesitate, too, to use the much-abused word ‘Diva’, although these women had earned such a status in the historical arc of pop long before any second flourishing opened up new territory for them. 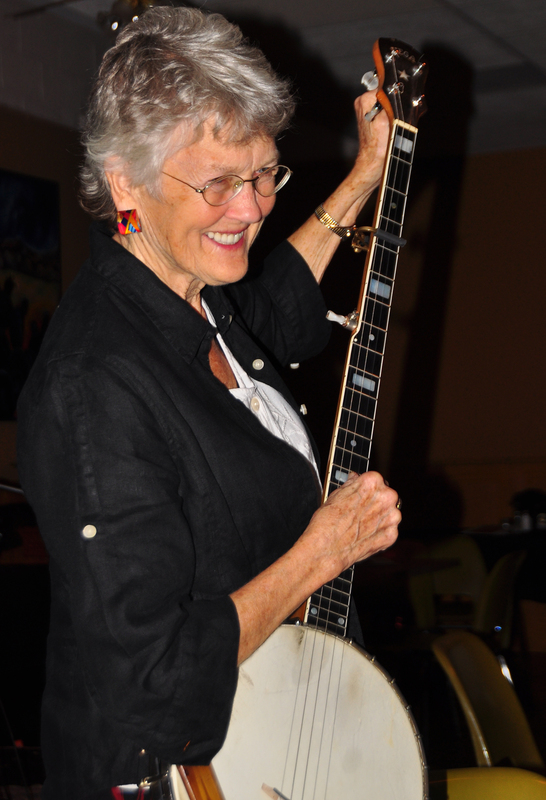 I would certainly hesitate to call Peggy Seeger a ‘Diva’, although if anything, she merits the title in her sphere even more than any of the women mentioned above. She is a touchstone for folk singers and songwriters of any age. While she herself has dipped in and out of the music business, always having plenty of other fish to fry as an activist and archivist, her songs, her musicianship and that timeless, multi-textured voice have made her a constant influence on her peers and subsequent generations. Her long partnership – personal and artistic – with Ewan MacColl, which began when she came to the UK in the 1950s, and their prodigious body of work embracing traditional folk songs and new material, made her in many eyes the founding mother of the modern folk revival. And it would be patently ridiculous to call her extraordinary new collaboration with experimental dance music pioneer Broadcaster a ‘rescue’. New York-born Seeger has long since returned to live in the UK after several years back in her homeland, and at the age of 77 is still singing and touring (albeit avoiding long flights these days) with great zest and verve. But Folksploitation has already ignited a whole new wave of interest in the woman whose voice cuts like the chant of a shamen across Broadcaster’s edgy techno beats with all the wisdom of the ages. It’s an utterly absorbing and frequently exhilarating experience. Seeger embraces the world of dubs and samples as if to the manner born. And it’s hard to resist the woman for whom Ewan MacColl wrote “The First Time Ever I Saw Your Face” when she consents to such a radical reworking. Here, as “First Time Ever”, its arrival is signalled by a Numanesque burst of electronica, before fragments of one of the great modern standards build into a remarkable collage that rescues it from the desert of a thousand hotel lobbies and sends it on a completely different trajectory. The album goes way beyond mere sampling. The compelling beat that underpins the bleak “Little White Grains” is a fascinating juxtaposition, hooking you in even as you’re floored by the grimness of the lyrics. And in the midst of all these new sounds, you never forget that Seeger’s work has always been lyric- (and specifically, story-) centred. As those lyrics often concern timeless themes – drug addiction, violence, abusive relationships – they have a contemporary resonance that’s a perfect match for this hustling, urban treatment. The narrative lines of “Bad, Bad Girl” and “Welcome to the Neighbourhood” are driven by Broadcaster’s insistent riffs, with Seeger’s voice given the full vocoder treatment, from which it emerges astringent and triumphant. Despite the essential darkness of much of the material, Folksploitation is a thrilling, hypnotic experiment which Seeger’s die-hard fans will probably approach with trepidation. But ultimately, it’s a surprising triumph for this redoubtable singer’s capacity to push the boundaries and make her listeners think again. So yes, let’s add Broadcaster and Peggy Seeger to that list.